Our Abpromise guarantee covers the use of ab20272 in the following tested applications. WB 1/5000. 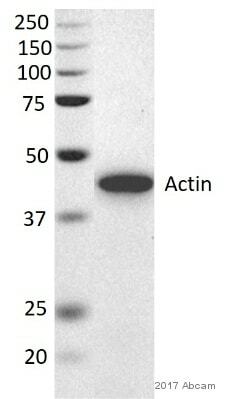 Detects a band of approximately 42 kDa (predicted molecular weight: 42 kDa).Can be blocked with Human beta Actin peptide (ab13772). Abcam strongly recommends blocking and incubation using 5% BSA as we have found that use of 5% milk seems to drastically reduce the intensity of the signal obtained. Please refer to WB image for further details. 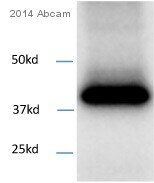 The membrane 1-4 was blocked in 5% BSA (1 hour). 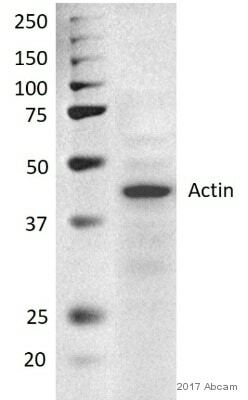 The membrane 5-8 was blocked in 5% MILK (1 hour). Abcam routinely uses 5% BSA to block, however following recent customer feedback our labs investigated the effect of 5% milk blocking. 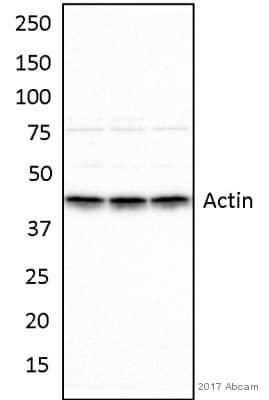 We can now confirm that milk is not a suitable blocking agent for this antibody and significantly decreases the signal on the membrane. Publishing research using ab20272? Please let us know so that we can cite the reference in this datasheet.